A good electric toothbrush can do more than just clean your teeth properly: It can also save you thousands of dollars at the dentist. And who doesn’t like clean teeth and saving money? Assuming you fall into that category of forward-thinking individuals, you’re probably wondering what is the best electric toothbrush under $100 – you know, something that is reasonably affordable, does its job, and helps you save money at your next dental appointment. To help you make this critical decision, we’ve compiled a special report just for you on the Philips Sonicare HX6731/02 Healthywhite toothbrush, a superb combination of plaque-fighting prowess and outstanding design. Let’s take a closer look now at the new Healthywhite toothbrush and see if it’s the right electric toothbrush for your unique dental circumstances. Obviously, it’s a little bit on the expensive side given the number of features it packs into one package. For some readers, this may be a concern given a limited budget. Nevertheless, a quality electric toothbrush can go a long way toward saving you money in the long run. For some individuals, an electric toothbrush like the Healthywhite might cause minor gum bleeding or other issues if you’re currently dealing with a dental problem. Though this generally quickly passes, it may still be a concern for some individuals with certain health conditions. The Sonicare Healthywhite can deliver over 31,000 brush strokes per minute – far more than a manual toothbrush could ever hope to accomplish (in fact, it’s physically impossible). Three different configuration modes means you can choose the setting that you need in order to achieve the whitest smile possible. Combined with some whitening toothpaste, this is a potent dental protection system. Saves you money in the long term: A toothbrush like this will guarantee fewer cavities and other dental ailments, thus saving you money at the dentist’s office. What if I can’t afford a toothbrush like this? Affording a toothbrush in this price range can sometimes be difficult for individuals who are currently operating on a fixed income or a tight budget. We understand completely – that’s why we’ve also done a review of a toothbrush in the sub $50 range from the same company. The Essence is another product from Phillips that lives up to the brand’s reputation for high-powered and effective dental cleaning solutions. If you don’t want to fork over the necessary cash for a Healthywhite brush, the Essence might be the perfect choice for you. Naturally, you won’t be getting the same exact benefits and features afforded by the Healthywhite model, but you’ll still be using an electric toothbrush whose spin rate (RPMs) vastly surpasses anything produced by a manual toothbrush. At the end of the day, investing in an electric toothbrush is a great way to ensure that you can properly care for your teeth while simultaneously lowering your dental bill. Te prevention of cavities, plaque, and gingivitis will play dividends down the road and help you to keep your dental costs under control for the foreseeable future. 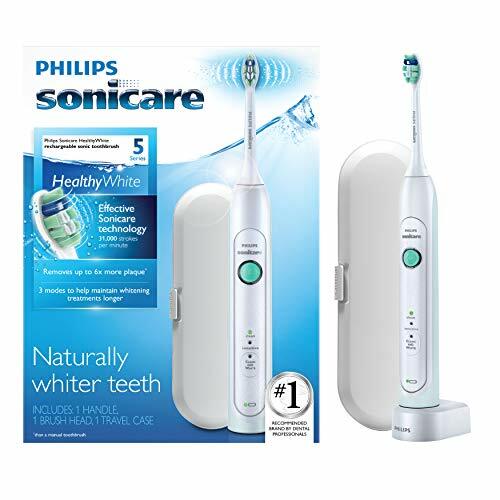 Investing in a toothbrush like the Healthywhite from Phillips will give you the tools that you need to protect your teeth and achieve a healthier mouth – in addition to more tangible benefits such as whiter teeth. We truly hope this report was an informative look at the toothbrushes available to you on the market today, and wish you the very best in finding the right toothbrush for your dental needs. 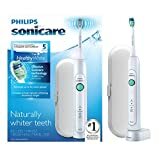 Like the old saying goes, “Brush twice a day and floss once a day.” But don’t just brush with any regular old (non-electric) toothbrush: Choose a quality product like the Phillips Sonicare Healthywhite, and reap the benefits for years to come. Happy brushing!